Summer Science Activity for Kids: Blowing Up Balloons with Gas? Ready for another fun summer science activity for kids? Let’s be honest. Nothing gets kids giggling like the word “gas.” So when you tell them you are going to use gas to blow up a balloon, they will be all over it! While they may have seen a balloon blown up a hundred times, chances are they have never seen a balloon blown up like this! For this summer science activity for kids, children will have the chance to blow up a balloon using gas created by baking soda and vinegar. It will seem like magic before their eyes when the balloon begins to inflate without someone blowing into it. This is the perfect summer science experiment that you can enjoy when boredom or a rainy afternoon sets in. Like the counter top volcano you learned about last week, this is an example of a chemical reaction. Kids really feel like real scientists when they hear the word “chemicals” and have the chance to mix them. Before you begin this science activity for kids, explain to them again that they are going to observe a chemical reaction. You can also introduce the word “Carbon Dioxide” again, explaining how this is what is created when the chemicals mix. Although we can’t see it, carbon dioxide takes up space so when it forms in the balloon, it needs somewhere to go! The result? The balloon begins to inflate with gas! This experiment will also cover some other important skills such as measuring, observation, and fine motor skills. To complete this experiment, all you need is a few household ingredients. That is the best part about the experiments in this series, it seems as though they all can be done on a dime. This science activity for kids is no exception. Below, you will find out exactly what you need and how to pull this experiment off without a hitch. Should you need to run out for some of these supplies, you don’t need to go any further than your local dollar store or grocery. Most of these items can be purchased for around $1.00. Place your plastic bottle on a flat surface. You should have cleaned it first. Pour in two tablespoons of vinegar into the bottle. A funnel may make this step easier. Take a balloon (make sure that it has never been blown up) and open the mouth of it by using the first two fingers of each hand. Put your fingers in the balloon and stretch it open. Have a second person spoon in one teaspoon of baking soda into the balloon using a clean teaspoon. Stretch the mouth of the balloon over the opening of the bottle with the vinegar. Watch what happens to the inside of the bottle! Watch the balloon as it expands and eventually pops. As you can see, this experiment is so easy but so amusing at the same time. 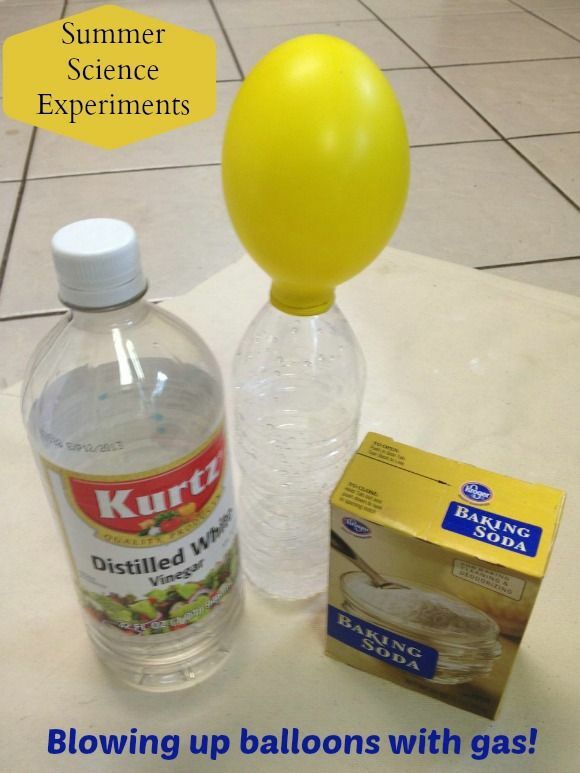 Hopefully you have several balloons on hand as children will enjoy doing this experiment over and over. This activity is the perfect way to show that gas takes up space, as it is responsible for blowing up the balloon. Without a demonstration like this, it could be hard for children to understand that something they can’t see with their eyes actually takes up space. Get kids giggling by telling them you are going to play with some gas! Gather your supplies and find a place on the kitchen floor, a picnic table, or anywhere really and get down to business. This is an easy science activity for kids and so fun, children won’t even realize how much their little minds are learning in the process! I love how easy and inexpensive this project is! And because the ingredients are something everyone probably already has on hand, it makes a great unplanned learning activity for any rainy day! Absolutelyl, Liz! I love projects that don’t require special ingredients or materials! What a fun and simple project for the kids. Kids… lets be honest my husband is going to love this too! Fun activity, thanks so much for sharing! Lol! My husband enjoys science activities, too! We just did another one this past weekend with my preschooler and my husband said, “Wow, this is really cool!” Lol! This is definitely a great activity for kids. As a science teacher I love stuff like this! Thanks, Jesica! Science wasn’t my best subject in school, but since I’ve been doing things like this with my kids, I’ve been learning right alongside them! My kids love this experiment. We tried it out last year after the kids became interested in hot air balloons. So fun! That is so awesome, Danielle! Don’t you just love it when they learn something and have so much fun that they want to do it again? My 2 oldest kids did this in Science class in 7th grade and thought it was so cool that they re-enacted it at home for the little ones. That is so neat! Love it when they learn something at school and want to do it again at home!